If you are digging into these pages, you will discover a few specials built by very talented mechanics like the one of Dag Sinclair Riise or Glen Breaks, but there are many others. Unlike the hybridization, which recycle most of the parts of the original bike, a special frame induce many special parts that the builder has to design and manufacture himself. 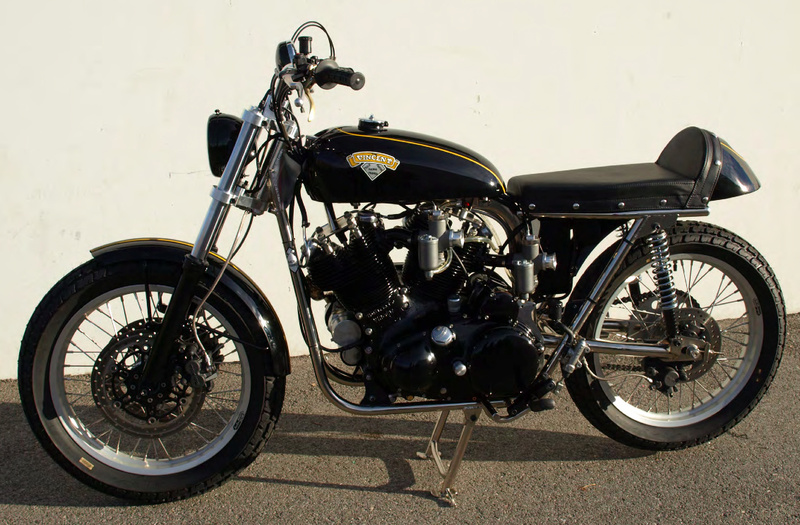 Thanks to John Ulver, this bike was identified as a 1000 Black Shadow Series C belonging to John Hugels (VOC SoCal) as the bike was in the 70s. Since she has converted back to the original spec. 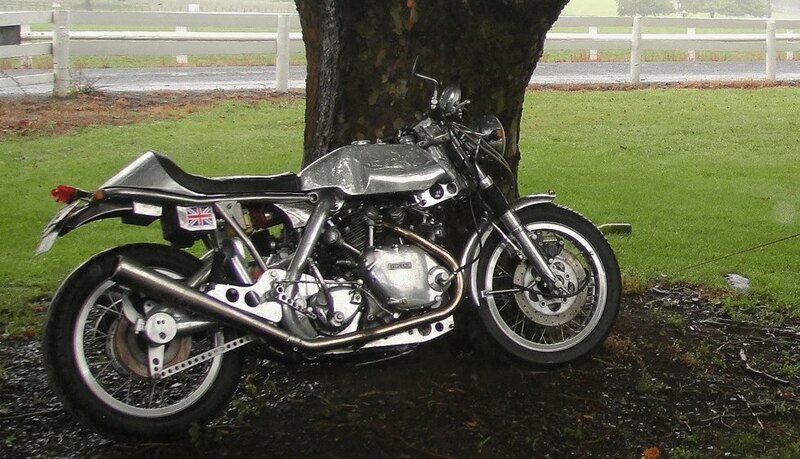 Anton Dee suggests the rear frame is a Matchless | AJS. After checking, it really looks like a AJS 16MS. This is an excellent example of what can be done quite simply i a workshop as the parts comes from aftermarket. A very good example of a bike which was raced in Italy in the sixties and seventies to finally be contorted in a road bike recently. Said to be a Cees Fick, it is likely not. 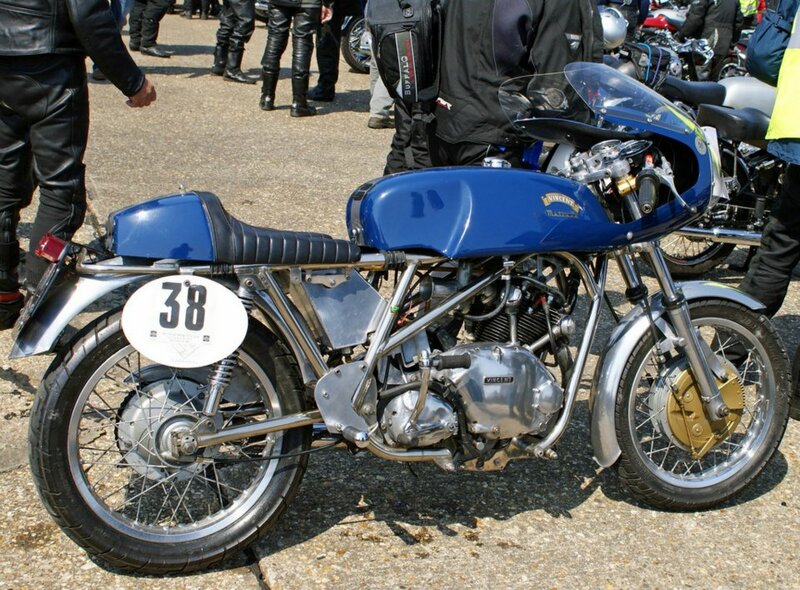 A quite rare Rickman Metisse with a Vincent Comet engine, the Rickman frame was more popular with Triumph Bonneville and Japanese donor bikes. The Comet fits pretty well. 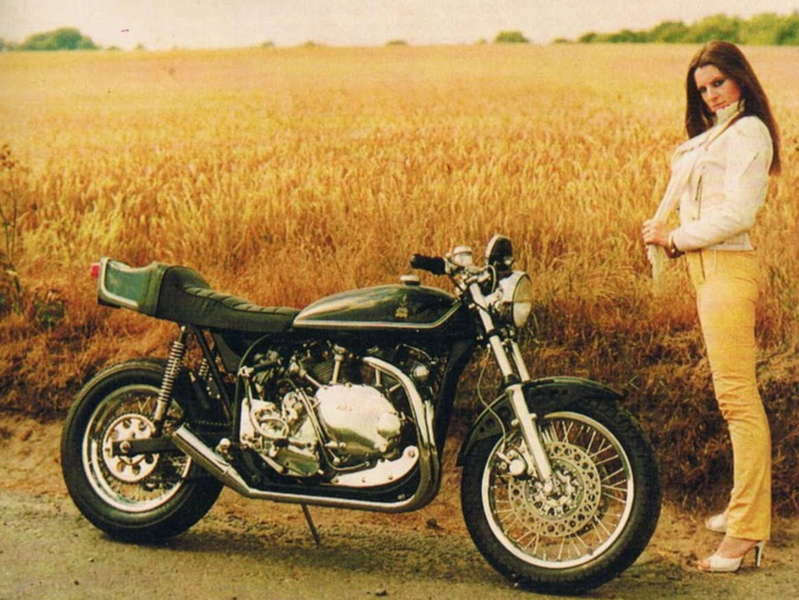 Despite the fame of Rickman and the numerous specials he built for Triumph, Matchless and other Norton, there is only one Metisse-Vincent known. Unique Seeley-twin. Note the engine tilted backward in the frame. It is nearly impossible to list exhaustively all the one off assembled on a Vincent base, but this one is quite representative of the late seventies / early eighties period with its Kawasaki KH tank, its seat which mimics the sports bike of that period, its front discs and its “Disco” color. 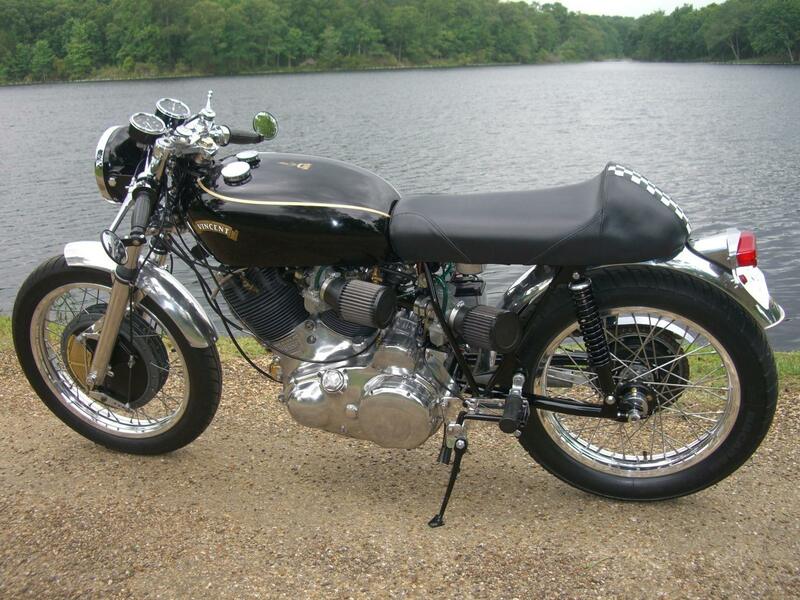 The frame looks like a Norton Featherbed but is rather an hybrid as the steering column with gussets is different. Jim Stevens mentions that this photo was published in October 1984 issue of Back Street Heroes magazine. The bike was built by a guy called Paul Mitchell and in the article he says it would do about 160mph, It won Best in Show at The Kent Custom show that year. The girl’s name is Karen. 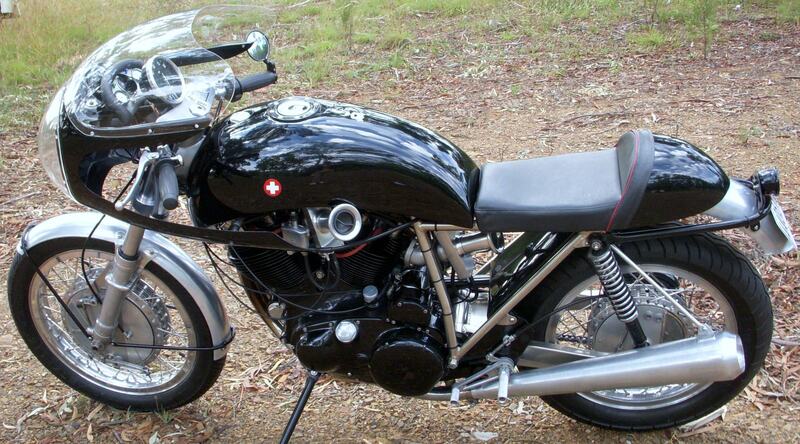 Seen on the web and presented as a fast (100 HP) Cafe Racer, the result is quite interesting and clean. Seen in New Zealand. 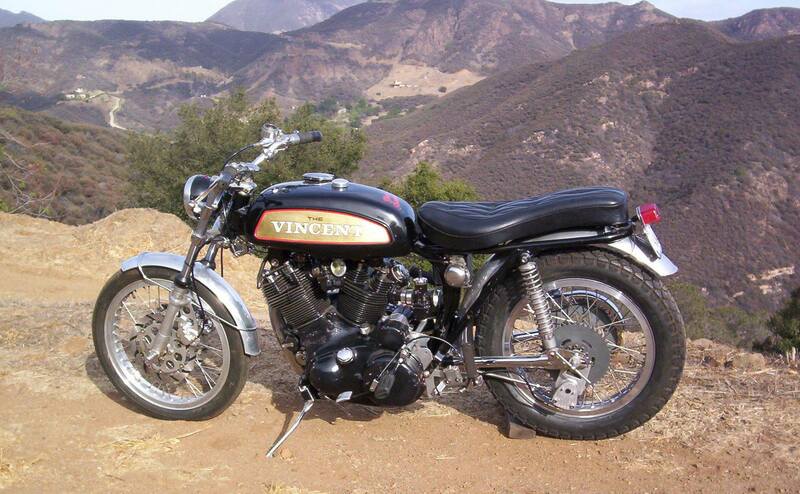 One off bike built by Chris Knibbs n 2001 over 5 months. The frame and swinging arm are made of aluminum, the exhaust is also homemade. Chris says that since the picture was taken he shortened the headstock area and made a new tank. Oil goes in the top tube and down the offside rear down tube. The bike is still used very regularly and is now in New Zealand. Built by Rupert Moran. 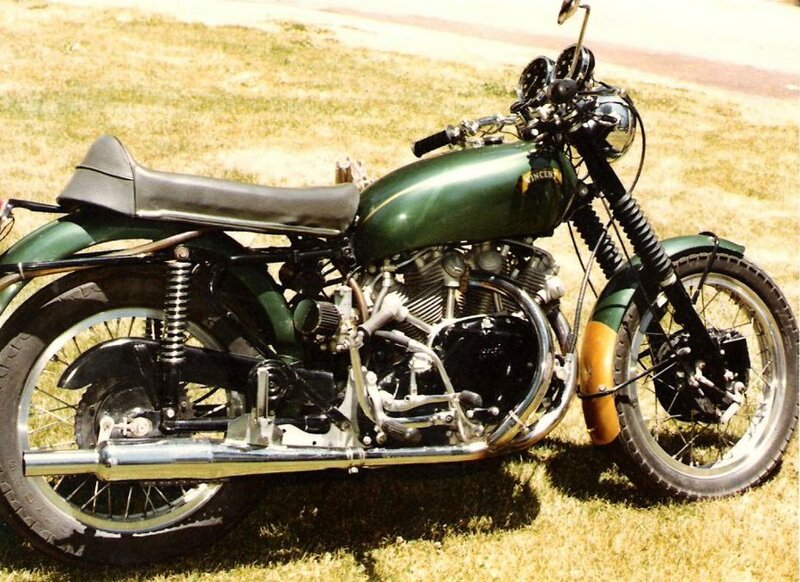 Note the bended tube connecting the swinging arm and the tank which tells it is definitely not an Egli-Vincent. The frame of this TrackMaster-Vincent was built specially for the Vincent v-twin unlike the one of the following picture which is a stock Trackmaster with the front rails removed. Another interesting one-off special. Unknown origin. Anyone knows about it? 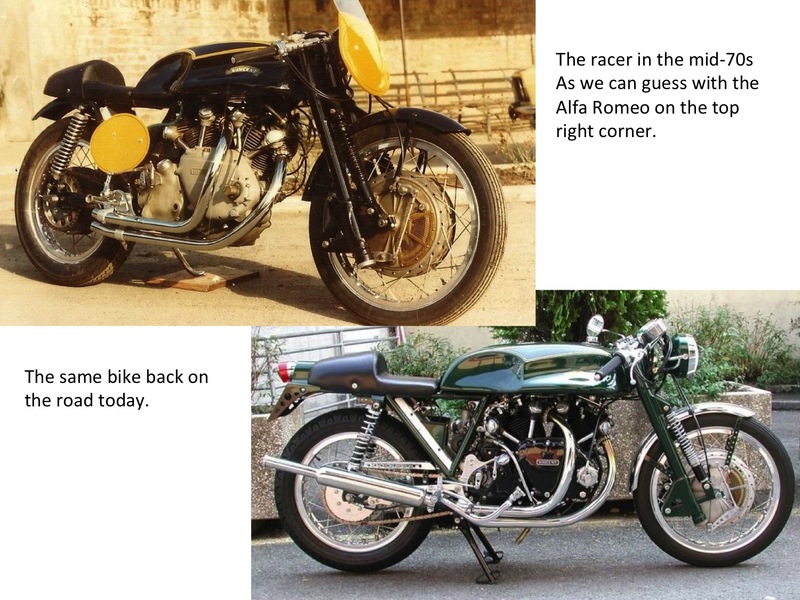 Gregg Mckean suggests Triumph rear end, Ken Phelps completed the information with Fontana 4LS front brake and Ducati front forks. Thanks guys. 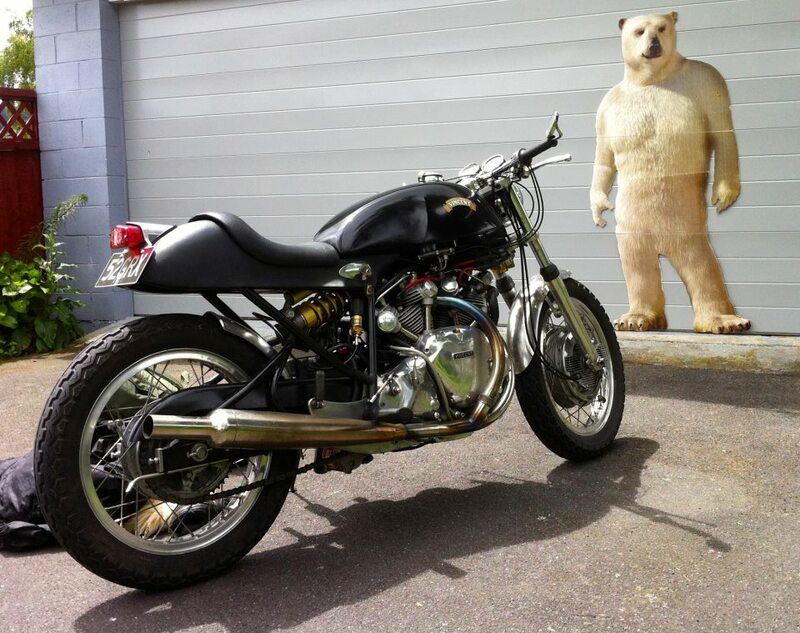 Yep, I found this also which is for sale in a Classic car-motorcycle trader shop. One of the comments posted tells that this bike is from Germany, the owner is Harmut from Dominator Engineering. He was/is the pilot for Max Lambsky’s Vincent streamliner for the last few years. 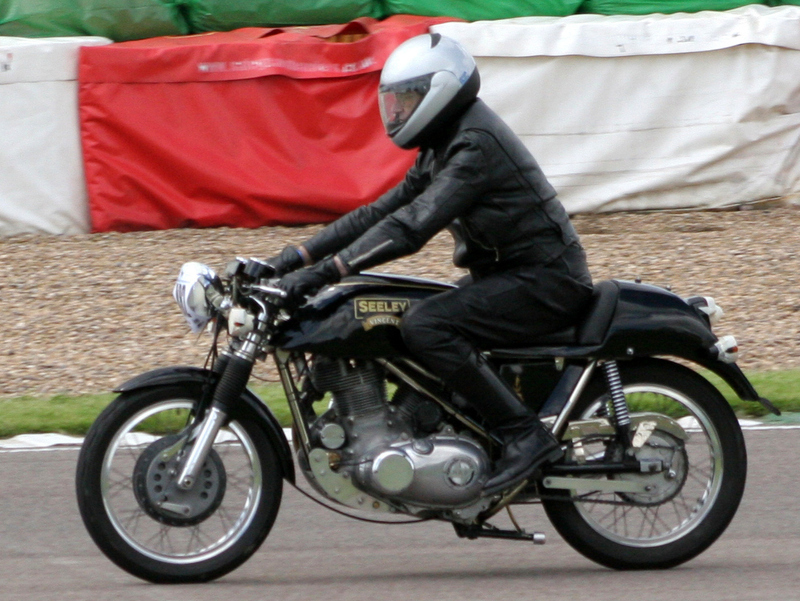 The front brake on the bike above is a Fontana 4LS or replica there of. The forks, yes are Ducati.